Italian | Rollo Whately Ltd. I recently noticed this in a catalogue of antique frames in Paris and was very taken with it. It is not our usual thing and to start with I had to convince Virginia that I was serious about it as it had a big estimate but I just couldn’t stop looking at the photo in the catalogue online. It was a piece of great good fortune that we were able to buy it. We were lucky, too, that it arrived here safely, thanks to Hedleys and also that Lynn Roberts, who runs, edits and contributes to the excellent Frame Blog has researched the frame and written in detail about where it may have come from. Even from the photo in the catalogue, I liked the way that, like some great paintings, your eye can’t ever rest on it and think, ‘ok, that’s what that is’ — before moving onto the next thing — here, you are made to keep travelling around the object, registering one thing here, and something else there until you end up where you started, to start looking all over again. The rather austere Roman sight edge section is like a moulding on a stone wall. This is reinforced by the corner joints which look much more like masonry than a normal frame sight edge, which even on an Italian cassetta frame has a mitred corner. 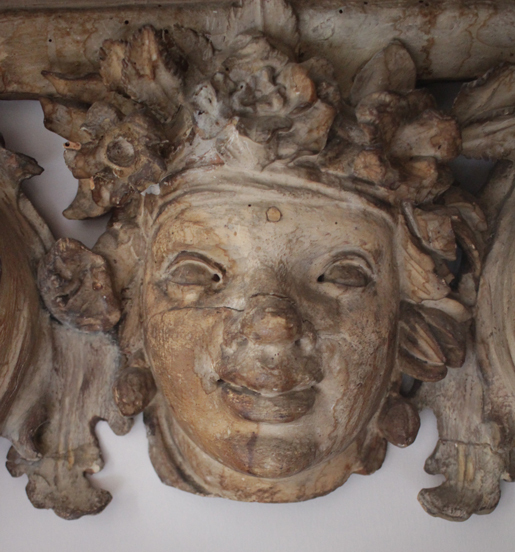 This plain sight moulding contrasts with the unusually elaborate and three-dimensional naturalistic carving. Lynn points out, correctly, there are just two long acanthus leaves, one each side. There is, however, something slightly wild and creepy about how alive these are: look how the ends of some leaves encroach on the sight moulding, grabbing hold of it like claws. 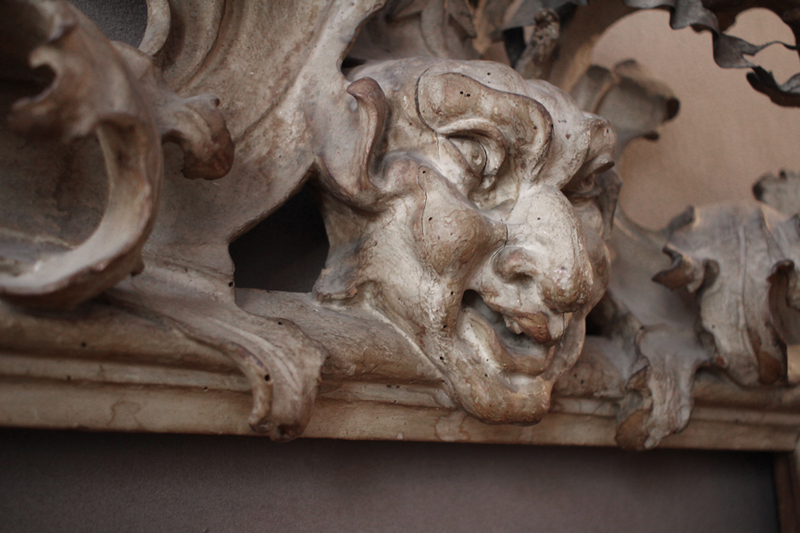 The malevolent feeling is focused in the beautifully carved, devilish mask at the top — which in turn contrasts with the much more benign mask at the bottom. Perhaps the frame is an allegory of the two faces of Nature? — both ‘red in tooth and claw’, and at the same time the bountiful source of the Spring as identified here by the narcissi/lillies (it is not quite clear) and the smiling, Arcadian presence at the bottom of the frame. Cruel, mocking, and giving. 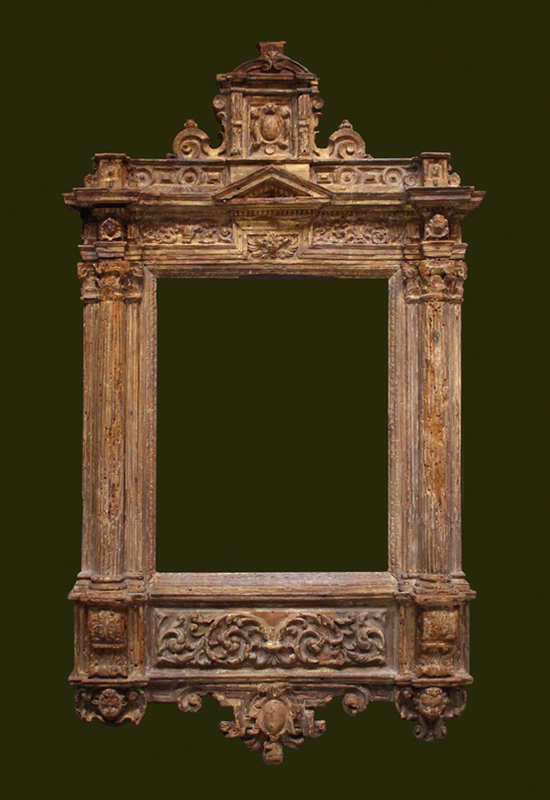 The frame was probably made in about 1670 and is carved in we think chestnut. It is in near-perfect condition. Technically, it is clearly a masterpiece of carving since it is made from just the four sides without anything added on (with the possible exception of the mask at the top). 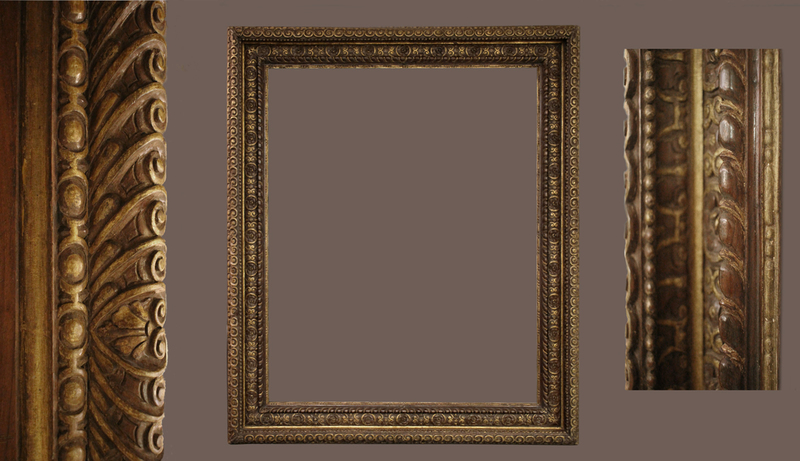 Often gilded frames are made up of parts, the gesso covers and fills the cracks and the gilded surface further conceals them. Here, there is none of that and all the ‘extra’ has been cut out, the stems and leaves carved in the round from a single piece of timber for each side (13″ wide and at least 6″ deep). To do this and keep to the original design and maintain a full flowing and natural line is the work of a master, or someone more used to working in stone or marble where this is the norm as projecting elements cannot be added on later. (Most frames are ‘patterns’, more or less complicated and more or less well executed, but this is a sculpture). The frame was never gilded. Scratched areas reveal a white gesso underneath with this painted light sandy grey, dry (?tempera, watercolour, an ochre coloured gesso) surface. 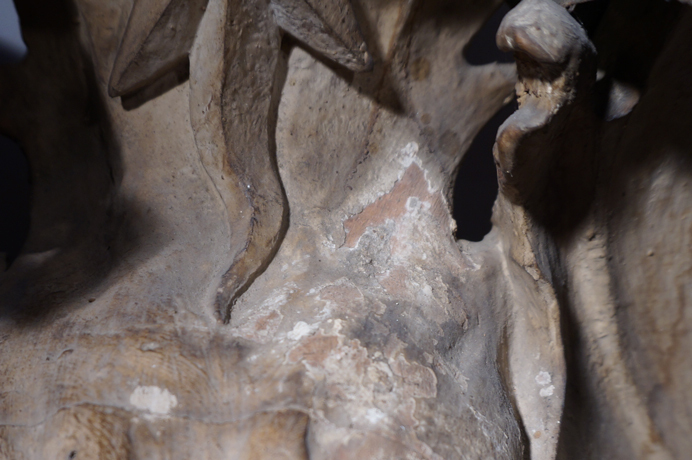 Because of the age of the frame it is hard to tell if the present modulations of the surface (lighter here, darker there) were intentional or are the effect of age. Whichever is the case, the effect is that of light sandstone. The impression of stone is further indicated by some rough chisel marks on the returns of the acanthus leaves at the lower corners, which look more like the roughing-out marks at the base or back of a marble sculpture than I am used to seeing on frames. Thanks to Lynn Roberts there is now some further evidence for what had been expected in terms of date, where it was made and now possibly for whom. Her suggestion that it was made in the orbit of Bernini is very exciting. 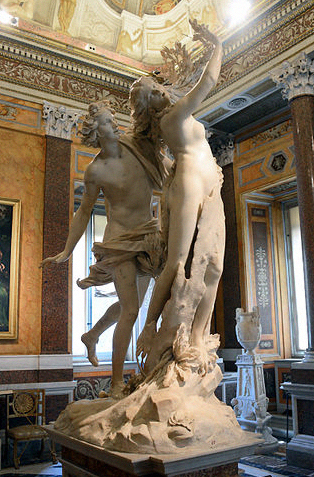 I remember clearly seeing for the first time the sculpture of Apollo and Daphne in the Borghese gallery and being quite simply amazed at it, I didn’t know you could make something like that — and it, too, shows Nature as not (for Daphne, that is) a good thing at all. 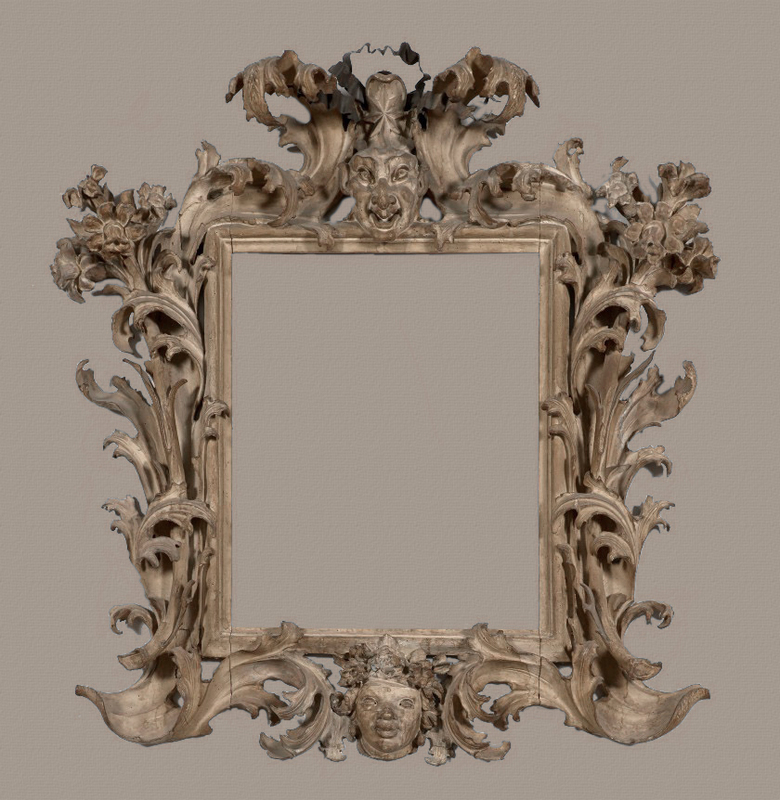 PS – Peter Schade saw this frame in Motefalco in Perugia – which shows the same wild carving and similar construction to our frame – though this one is gilded. A nice example of a cassetta frame with a bold egg-and-dart outer edge and punched ornament to the frieze. We were recently lucky enough to work on this 16C Tuscan frame, preparing it for fitting on to a 16th Century Florentine portrait. All carved in walnut and parcel gilded, it is possibly the finest frame that we have ever had here, with seven rows of wonderful carving and a design that I have never encountered before. 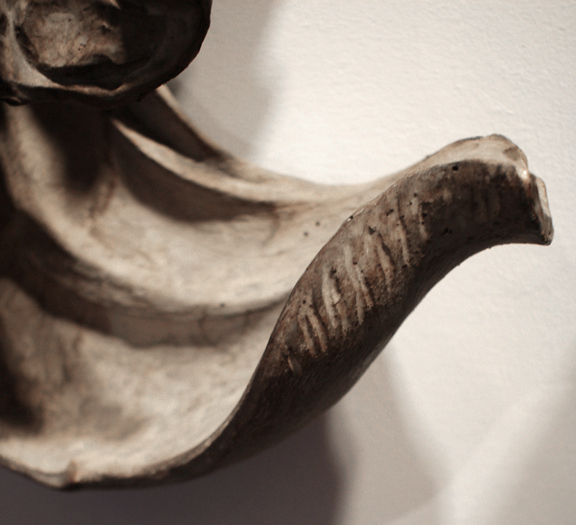 The fully carved surface on the inside of the hollow makes it particularly spectacular. What was most gratifying was to see the effect on the walnut surface of burnishing which brought it back to life. Walnut is an almost magical wood, simultaneously incorporating both cool and warm colour tones. 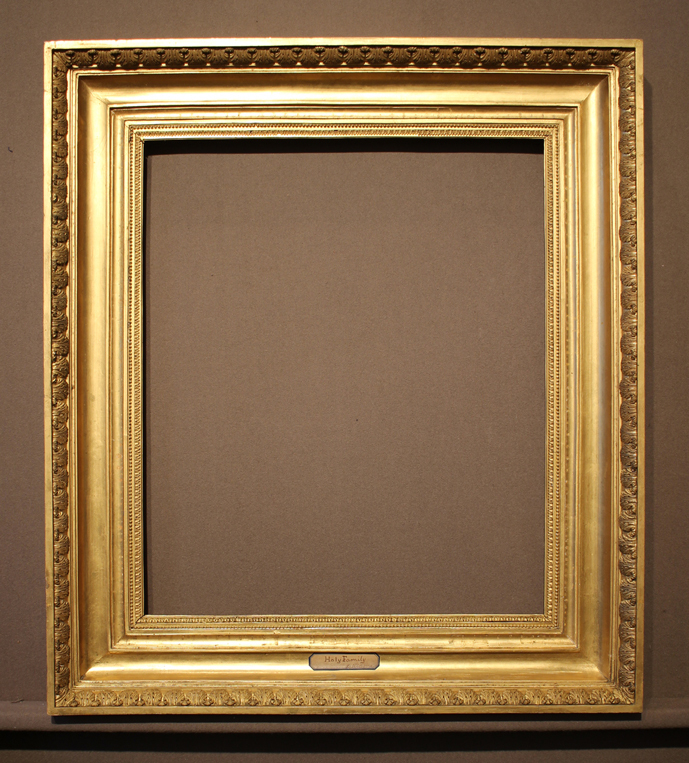 The gilding outlines the pattern of the carving and in this frame you can see the way that carving, gilding and colour each play a part in the whole, with none predominating and the overall effect that of balance, albeit, in this case, a particularly sumptuous balance. 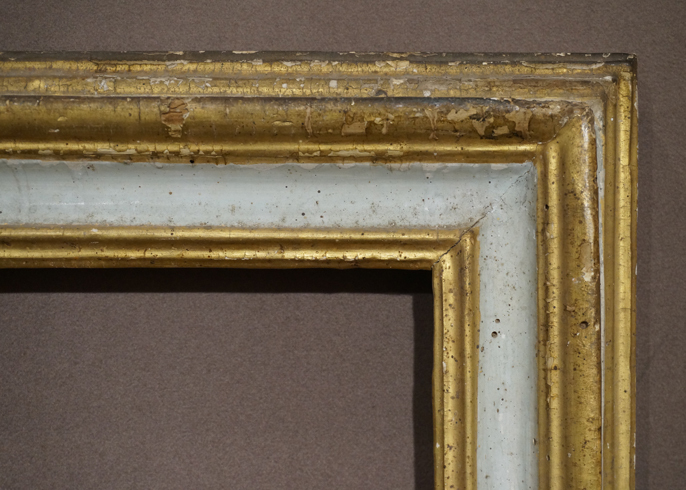 This frame must be Italian and it is clearly very old — it has suffered worm damage, damp, has been altered in its size and put on a new (19th/20C) backframe, but still it is somehow very fine. I have done nothing to it other than wet-out the dusty surface and colour-out the chips all over on the gesso. 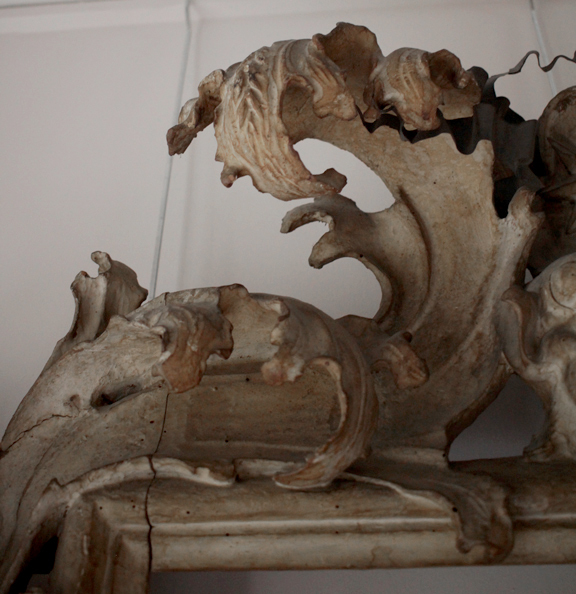 Someone came into the shop and said it reminded him of Petra — the wedding cake- like stacking of pediment upon pediment. I realised that the antiquity of Petra, ‘half as old as time’, is like our frame where the effect of time on something that was once very ‘fine’ and elegant is, itself, now part of the attraction of the object. I am reminded also of the wonderful barley-twist columns in the cardo at Apamea in Syria. It is not just the Romanticism of a ruin, it is also the actual quality of the effect of time. So often we see paintings that have been restored, re-varnished and retouched and we often sell frames that need repairs. The odd thing is that old frames, when repaired, sometimes lose something. Not always, just sometimes, something that was there is missing which is suppose is nothing other than time itself. 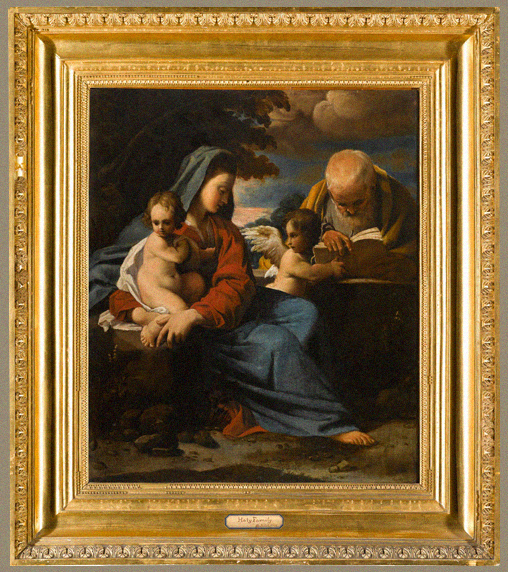 We were recently asked to do some minor restorations to a frame for this painting by Bartolomeo Schedoni (1578-1615). The neo-Classical frame is not contemporary with the painting but of exceptional quality. I think that the frame is Roman? from about 1780/1800. All the ornament is carved and perfectly gilded. Particular care has been taken in the gilding and the contrast between flat and burnished areas — just look at the shell-like leaf on the burnished background below! Some two complete rows of ornament was missing — you can see the ‘shadow’ of something that was there in the photo above — we decided not to replace this. A Venetian frame illustrating what I think of as the ‘sunburst’ effect — ornament radiating out from the painting. A good example of perfect balance in a frame where the weight of section, scale of the ornament and overall size all seem to fit together perfectly to make an object desirable in its own right. 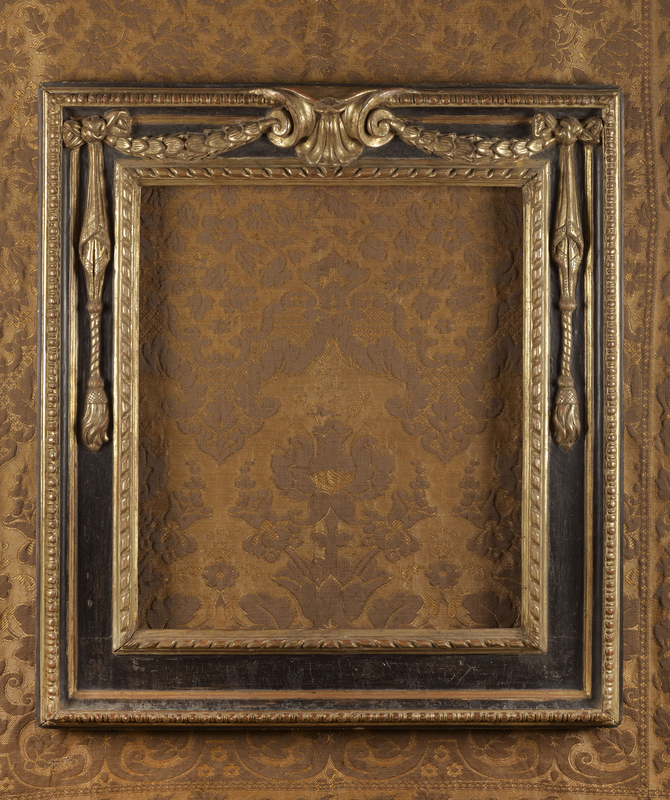 These frames are unusual but seem fairly standard — they are often small and have one of three or four patterns on the slightly convex frieze. The ornament is made from pastiglia (literally, pastework) where gesso is modelled. The material in this example appears quite fibrous, as if gesso had been mixed with paper pulp. 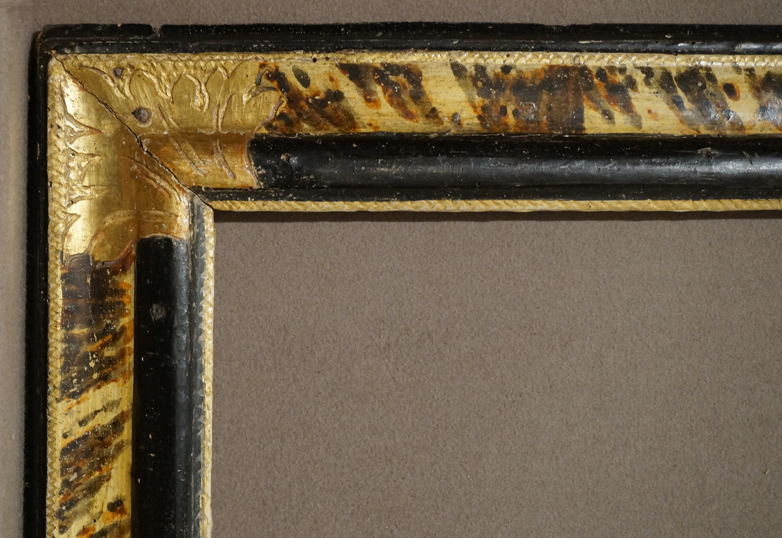 A classic type of frame from Italy, this type of frame is known as cassetta and with the black and gold like this is from the 16th Century. Note the elegance of the very simple section (a flat piece of wood with added sight and back edge mouldings) which relies for its effect on the balance of the gilded lines and ornament on the black painted areas rather than elaborate carving. 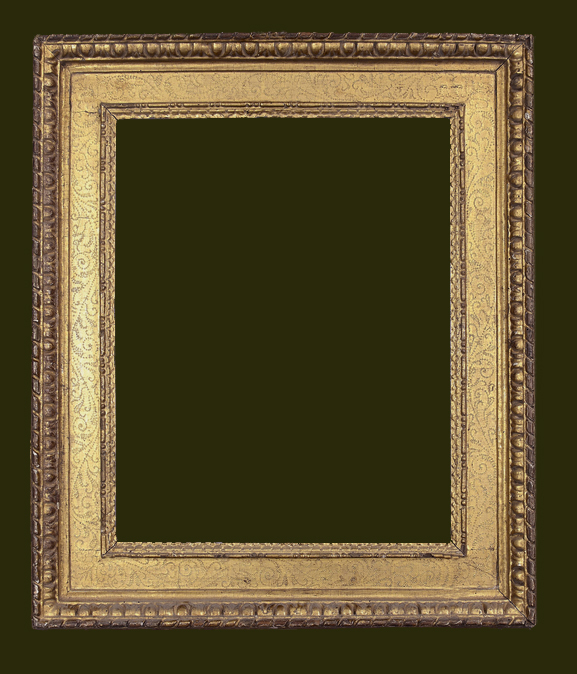 This type of frame is often copied, either like this rather elegant example with four lines of gilding, or more crudely, often without the back-edge moulding. Here is another example, smaller and with engraved and punched ornament on the gilded centres and corners. Interesting Sansovino type frame — the inner part is modern, but the outer carving is late 15th Century and in good condition. The carving is very elegant, the faces of the caryatids are charming. Matt blue paint on the background and red lacquer on the gilding for the jewel-like cabochon ornament. 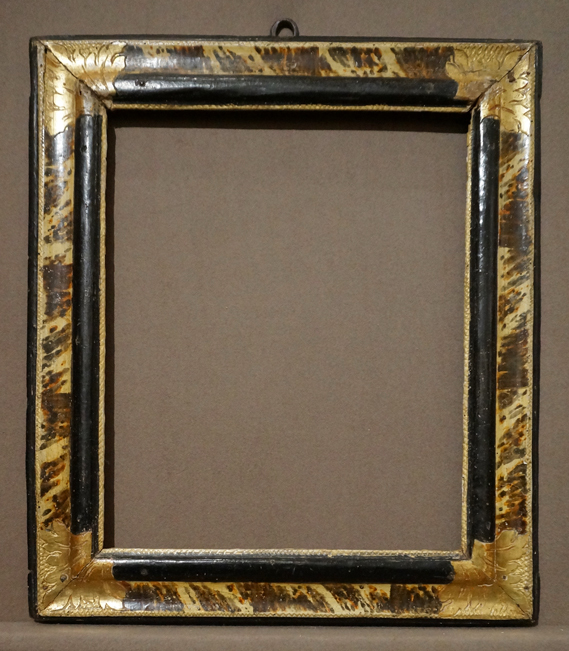 A very elegant small frame with brightly gilded corners against a rather sketchy ‘tortoiseshell’ pattern. 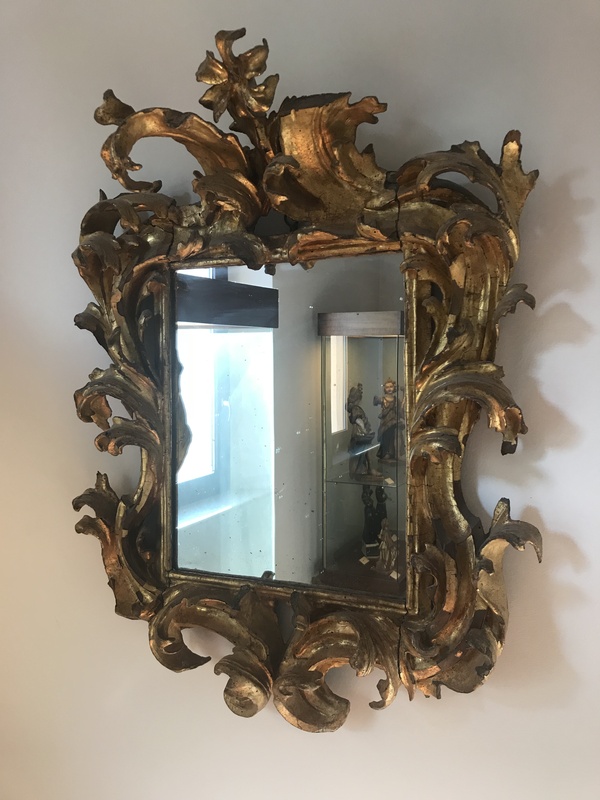 The frame has the ‘hazzling’ (looks like stitching) on the sight and back edges, which is typically French but the pattern and gilding are more Italian. The gilded line around the sight edge is particularly effective. The frame is in perfect condition. Very attractive Italian (probably Roman) 18C moulding frame with unusual duck-egg blue painted surface in the hollow. Some damage to the lower edge which can be repaired. The gilding on this rather architectural Roman is original (a rather lemony colour) but the painted surface has been recreated. 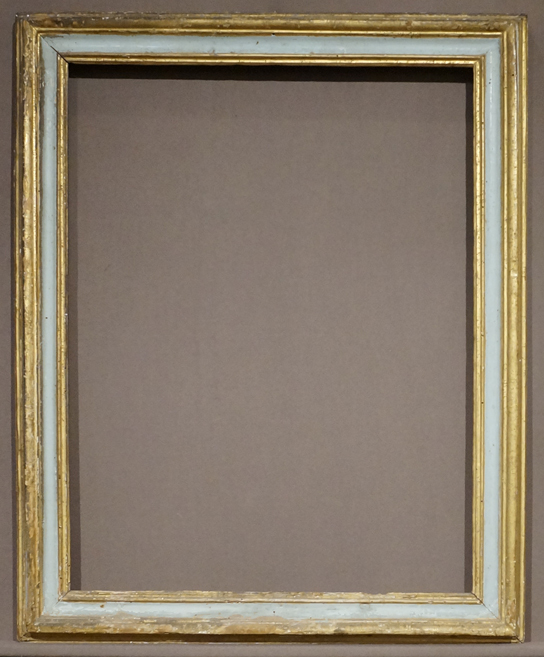 When the frame was bought it was covered all over in bronze paint. 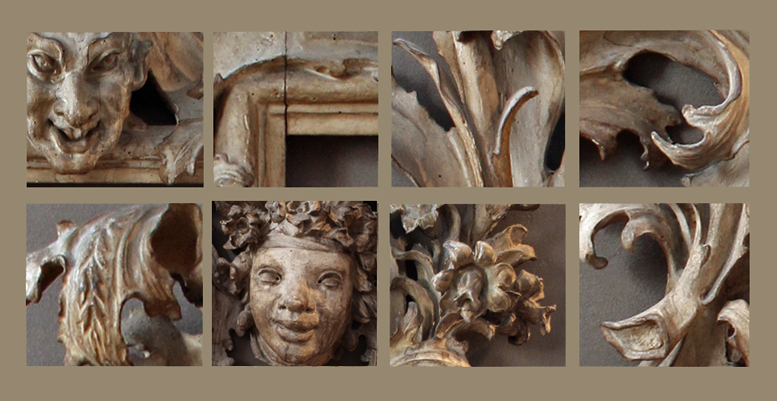 This small frame is lovely — a sort of (French) Berain type sight edge, punched frieze (rather Italian) and then bold gadroons with flower heads in between (often a motif of English frames of the early 18C), with a further row of carving behind the gadrooned top edge and a stepped back edge.